Dolby Atmos is the greatest breakthrough in home cinema audio since the introduction of 5.1 surround sound. The concept is simple: detach sound mixes from "channels" in favor of individual "objects" that can be mapped anywhere in a 180-degree sound hemisphere, after which your AVR's processor then places objects in specific speakers based on your room's configuration. Whether you're rocking the minimal 5.1.2 or blasting a full blown 7.1.4, Dolby Atmos mixes are designed to play well in one and all. But, you're probably saying to yourself, "Hey, I know 5.1 and 7.1, but what's all this extra '.2' or '.4' business?" Ah, yes, the key ingredient. Dolby Atmos, and competing technologies like Auro 3D and DTS:X, use height speakers to create an immersive bubble of sound. The aforementioned hemisphere. "5.1.2" takes a traditional 5.1 surround layout and adds one pair of stereo height speakers, while "7.1.4" takes a standard 7.1 layout and adds two height pairs. Dolby Atmos is capable of even grander speaker configurations too, the only limitations are budgetary -- you need a better processor and more amps. The question, then, is how to add height channels? There are two ways. The first is in-ceiling speakers. With one pair of height speakers, you'd pop those in directly over your main listening position. With two pairs, you install a front pair between your main listening position and your L-C-R speakers, and a second pair between you and your surround back speakers. Because some folks are unwilling, or unable, to do in-ceiling speakers, Dolby developed a way to use up-firing drivers to bounce directional sound effects off your ceiling, simulating the aural sensation of having true in-ceiling speakers. Welcome to the world of Dolby Atmos enabled speakers. 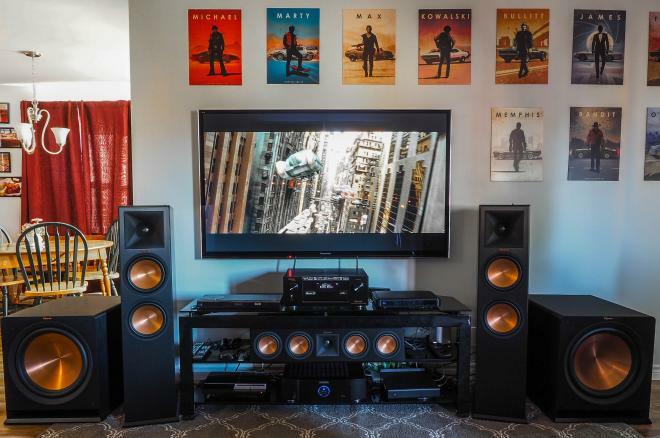 Earlier this year renowned speaker manufacture Klipsch jumped into the Dolby Atmos market by building two Dolby Atmos enabled speakers for their well-reviewed Reference Premiere Series. The first is a monster flagship tower with an integrated height elevation speaker, while the second is what's called a Dolby Atmos add-on module. IE, a separate speaker that, because it sits atop a standard tower or bookshelf monitor, can be dropped into an existing system. I first demoed the revamped Reference Premiere Series in Dolby's Burbank laboratory. The system impressed, but time was limited to a few short demos (and I often find manufacturer demos a little louder than necessary). 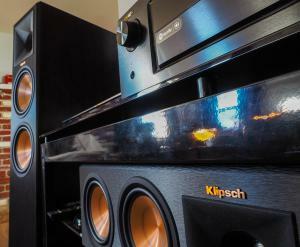 As luck would have it, Klipsch invited us to borrow the entire system for a long term review. I've now had the RP Series as my main system for the last three months and I hate to see them go. [Insert sad face emoji here.] Have a seat and grab an adult beverage. Let's get to know these bad boys. RP-280FA Towers (2) -- Tipping the scales at 71.75 lbs, standing 43" tall, 10.5" wide, and 19" deep, the RP-280FA consists of one main channel speaker and one up-firing height channel. The main channel boasts a 1" Titanium Dome LTS Tweeter with Hybrid Tractrix Horn for high frequencies and dual 8" Cerametallic Cone Woofers for low frequencies. This Bass Reflex MDF enclosure sets the crossover at 1750Hz and includes dual binding posts for bi-amping. This 8 Ohms compatible speaker has a 32-25kHz (+/- 3dB) frequency response, 98dB sensitivity (@ 2.83V / 1m), and is able to handle 150W of continuous power (600W peak). The built-in height elevation Dolby Atmos speaker features another 1" Titanium Dome LTS Tweeter with Hybrid Tractrix Horn and a single 6.5" Cerametallic Cone Woofer with the crossover set at 2kHz. This "acoustic suspension" MDF enclosure has only single binding posts. This 8 Ohms compatible speaker conforms to the Dolby Atmos specification for sensitivity and frequent response, and can handle 75W of continuous power (300W peak). With a finish choice of Walnut Wood Veneer and Black Wood Veneer, these MSRP for $1,199.00 each, a $600 premium over the $599.00 RP-280F floorstanders (they do NOT include a Dolby Atmos height elevation speaker). RP-450CA Center Channel (1) -- Color matched to the RP-280FA with your choice of Walnut or Black, this RP Series flagship center channel weighs a hefty 35.7 lbs, while measuring 31.13" across, 6.81" tall, and 14.51" deep. It boasts a 1" Titanium LTS Tweeter with Hybrid Tractrix Horn for high frequencies, and quad 5.25" Cerametallic Cone Woofers for low frequencies. This is a Bass Reflex MDF enclosure with a rear-firing Tractrix port. There are single binding posts. This 8 Ohms compatible speaker has a 58-25kHz (+/- 3dB) frequency response, 97db sensitivity (@ 2.83V / 1m) and is able to handle 150W of continuous power (600W peak). It MSRPs for $849.00. RP-140SA Dolby Atmos Add-on Modules (2) -- These smaller, up-firing elevation speakers weigh only 7.6 lbs each, and measure out to 7" tall, 6" wide, and 11.25" deep. They boast a 1" Titanium LTS Tweeter with Hybrid Tractrix Horn and a 4" Cerametallic Cone Woofer with the crossover set a 2kHz. This Acoustic Suspension MDF enclosure features single binding posts, conforms to the Dolby Atmos specifications for frequency response and sensitivity, and can handle 50W of continuous power (200W peak). Available in a brushed polymer veneer (black), these MSRP for $499.00/pair. R-115SW 15' Powered Subwoofers (2) -- At 75.4 lbs, these monsters take up a lot of space, measuring 21.5" tall by 22.3" deep by 19.5" wide. Powered by their own digital 400W amp (800W peak), this sub is an MDF Bass Reflex enclosure with a 15" (38.1 cm) long-throw copper spun cerametallic, front-firing woofer. Inputs include L/R line-level/LFE RCA jacks as well as a Wireless WA-2 Port. The frequency response is 18Hz-125Hz (+/- 3dB) with a 122dB maximum acoustic output. Phase is switchable between 0 and 180 degrees, and the power switch can be set to On, Off, or Auto Power. You can have this sub in any color you like... as long as it's Brushed Black Polymer Veneer. They MSRP for $899.00 (each). 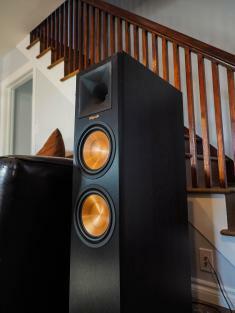 RP-260F Towers (2) -- The Reference Premiere mid-tier floorstanders weigh in at a relatively light 49.5 lbs. Dimensions are 39.6" tall by 9.01" wide by 17.65 deep. Color selections include Ebony or Cherry (a color choice for all the non-Atmos center channels and floorstanders). High frequencies are handled by 1" Titanium LTS Tweeter with Hybrid Tractrix Horn, while Dual 6.5" Cerametallic Cone Woofers handle lows. Crossover is set at 1800Hz. This Bass Reflex via rear-firing Tractrix port MDF enclosure also features dual binding posts for optional bi-amping. Frequency response is rated to 34-25kHz (+/- 3dB) while these 8 Ohms compatible speakers can handle 125W of continuous power (500W peak) with a 97dB sensitivity rating (@ 2.83V /1m). These MSRP for $499.00 each. RP-250S Surround Speakers (2) -- Described not as bi-pole, but rather "dual array monopole", the RP-250 boasts dual 1" Titanium LTS Tweeters with Hybrid Cross-Section Tractrix Horns, for high frequencies and dual 5.25" Cerametallic Woofers for lows. They weigh 15.7 lbs each, and measure 13.5" tall by 12" wide by 7.92" deep, although that's somewhat misleading because they're pentagonally shaped. These 8 Ohms compatible speakers have a 58-24kHz (+/- 3dB) frequency response, a 95dB (@283V / 1m) frequency response and can handle 100W of continuous power (400W peak). They MSRP for $424.00 each and are available in black. Straight out of the box, the Reference Premiere Series is gorgeous, especially with the black speaker grilles off to reveal the warm copper Cerametallic woofers. They scream high-end audio and will be conversation starters for anyone that enters the room -- even people who aren't normally audio enthusiasts. Each speaker in the Reference Premiere Series appears well made. Binding posts are solid, with a high-end feel. And the color-matched RP-280FA & RP-450CA with real wood veneer look even more polished and finished than polymer veneer models. My test set arrived in Walnut for those three speakers, while everything else provided was a variation of black. As far as mixing and matching colors goes, the Reference Premiere Series offers some components in black-only, as well as exclusive colors for Atmos speakers and non-Atmos speakers. The one constant is black (or ebony) across the product line, but I find this a little perplexing and wish the colors options were a little more consistent. If I were to purchase a set of these, something I'm seriously considering, I'd go over all black. And ready to play with new toys. After placing the RP Series around your room, wire them to the AVR or pre-pro/amp combination of your choice, run room calibration, check your measurements, adjust levels, and go to town. For the first two thirds of my demo period, I toggled back and forth between a 5.2.2 Dolby Atmos configuration and a traditional 7.2 setup. Powered by the excellent Yamaha AVENTAGE RX-A1050 AV Receiver, I toed in the RP-280FA towers directly towards my main listening position and setup the subs on the outside of each. For what it's worth, in Klipsch demos, they place the towers further out than the subs, a placement I would have mimicked with a little more room. The center channel sat in my TV stand. And, after auditioning them, I elected to place the RP-260F towers in the side surround position placed at a 45-degree angle behind the main listening position. The RP-250S surrounds, normally placed on the sides, then took up position on a shelf for Surround Back Left and Right for 7.2 listening. Then, for the last third of my review, I swapped in a Denon AVR-X6200W AV Receiver and Marantz MM7025 two-channel external amp to power a 7.2.4 Dolby Atmos configuration. For this, I moved the RP-260F towers forward so they were perpendicular to the main listening position, and set the two RP-140SA Dolby Atmos rear height speakers on the same shelf as the RP250S surrounds. In 5.2.2, you're looking to spend just over six grand, while 7.2.4 is just under $7400. A bargain, in my opinion, for this much power. But remember most of these components are the flagship versions of each. They have smaller towers and subs and center channels; they have bookshelf monitors for surrounds. In terms of specific settings for the Dolby Atmos enabled speakers, there are two schools of thought. Some argue your distance measurement should take into account bouncing a signal off the ceiling (IE, the angular path from speaker to ceiling to ear), while Klipsch engineers said they simply measure from speaker to ear (IE, only a couple more inches further than the front-firing drivers). I personally followed the latter advice, and it worked perfectly; you might want to experiment. As for crossovers, the entire Reference Premiere Series is pretty beefy. Both pairs of towers as well as the RP-450CA center channel were comfortably set as "Large" or full range speakers, while I set the larger Atmos elevation speakers in the RP-280FA towers to 60hz and the smaller RP-140SA elevation speakers to 80hz. Overall, installation is a bit daunting in terms of size and weight, but with a little patience and calibration, the reward is cinema-quality sound right out of the box that only improves as they break themselves in. Powerful. Flexible. The two words that come to mind when I think about Reference Premiere. My original goal was to rock out a full 7.1.4 Atmos configuration for the entire loan period, but fate intervened and I, instead, spent many hours learning the value of a smaller Atmos system. In 5.2.2, I unleashed 'Mad Max: Fury Road' into my living room for the first time. Perhaps the best Dolby Atmos mix to date, this track is a hurricane of immersive sound effects, rumbling LFE, and auditory carnage. It doesn't just play loud, but reinvents what it means to play loud, whilst adding in many intricate details into layered, er, loudness. I'm not in love with the portrayed character thematics, but 'San Andreas' also offers another demo-worthy presentation, with pounding waves and timbering skyscrapers testing out the Reference Premiere's dynamics. 'Bram Stoker's Dracula' sounds fantastic too, with the RP-280FA towers making it feel like creaking metal gates were opening up over my head. I also watched numerous TV Series via my DirecTV Genie DVR; upmixed to Atmos via Dolby Surround, Baseball Playoffs and Sunday NFL marathons come to life with elevation channels. The bottom line is, with speakers like these, once you turn on Atmos, it's really hard to turn it off (both native and up-mixed iterations). Your living room or dedicated home theatre will feel shorter, less immersive, less involving. Heck, even with native 7.1 mixes, I opted to watch them in 5.2.2 because it was simply a better experience. And, if one follows Dolby's guideline for speaker placement, I learned that, while I prefer a 7.1.4 system, 5.1.2 does a fine job of recreating theatrical Atmos experiences. For the last part of my demo, I unleashed the full might of 7.2.4 for more casual watching (the new 'Game of Thrones' Dolby Atmos Steelbooks are the bomb) and one final review. 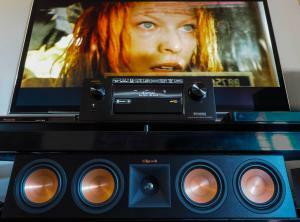 'The Fifth Element' Dolby Atmos mix is so good it out performs many modern (native) Atmos mixes. In full 7.2.4, it feels like you're flying to another universe. Roaring spaceships and rumbling explosions shake the walls, and the whole thing matches the specificity and directionality running from an in-ceiling 7.1.4. The Reference Premiere Series are some serious speakers with cinema-quality sonics. While I was overall thrilled with my review period, I came away with a few minor sticking points. The first question is simply one of size. The Reference Premiere Series is gorgeous, an instantaneous focal point for any listening environment, especially with the covers off to reveal those copper woofers. But in small to even medium sized rooms they will eat all the free space you have (and then some). Basically, if you're the type that likes to keep your sound gear hidden, or if you're lacking in space, you probably want to consider a different system. Bass management will also require a little more experimentation and calibration than other systems I've tested; these dual 15" subs are hella powerful (I might opt for the 12" or 10" models, personally). I might also swap in an extra pair of RP260F towers in place of the RP-250S surrounds, but that might be more of a personal preference on my part. More thoughts below. Sonically, though, the Reference Premiere series offers tremendous performance, power, and quality for this price point. RP-280FA Towers -- The 280FA floorstanders are absolute monsters; Klipsch is definitely living up to their concert speaker heritage. The front facing drivers deliver incredible dynamic range from almost-sub-quality bass all the way up to screaming highs. From movie soundtracks and music, you almost don't need a subwoofer with these towers. In fact, if you live in an apartment, adding a sub to these will likely void your lease agreement. As for the built-in Dolby Atmos enabled speakers, they're -- thus far -- the best Dolby Atmos speakers I've heard since the format's launch last year. Their ability to mimic in-ceiling speakers is astonishing. As a true proof of concept, I isolated the 280FA's Atmos speakers using the Yamaha AVENTAGE RX-A1050's Zone 2 output, effectively listing to stereo music with only the Atmos up-firing speakers. No exaggeration whatsoever, but it sounded -- audibly, directionally -- as if I had turned on my in-ceiling KEF Ci200RR THX speakers. That's the moment I knew these were a home run. The only nitpicks I have with the RP-280FA models are size (they own whatever room they're in) and that, without rear Atmos speakers, there are the occasional sound effects that will sound more "tall" than "overhead", something I've noticed from just about every Dolby Atmos enabled speaker. Basically, it's a very good trick, but sometimes you can't best literal in-ceiling. RP-450CA Center Channel -- I adore this center channel. It is attractive, articular, clear and with its 31.13" width, takes up most of the shelf space on a TV stand. This could be challenging, depending on your furniture, but it also is one of the first center channel speakers I've heard that goes toe-to-toe with a system's front towers while completely filling the gap between the front and right channels. The only downside to this specific model is that it costs $200 more than the RP-450C (not Atmos) version because it is constructed with real wood and matches the RP-280FA color choices. I understand wood is not cheap, but I'm not sure if it's $200 better looking than the polymer veneer option. RP-140SA Dolby Atmos Add-on Modules -- If the Reference Premiere Series is all about flexibility, this is the reason why. At an extremely affordable $499/pair, these are probably the best sounding budget add-on modules on the market. Sure, their 4" woofers don't compare to the larger 6" ones living in the RP-280FA, but they're also not as big. And you can add them to almost any system, not simply this one. That's right, Klipsch believes the RP-140SA will blend seamlessly into a non-Klispch surround system and, after hearing these, I'm inclined to agree. R-115SW 15' Powered Subwoofers --These subs are what I imagine would happen to normal subs if they were shot full of gamma rays and became HULK SUBS (SMASH!). Attractive, eye catching, and so powerful they'll literally shake walls. 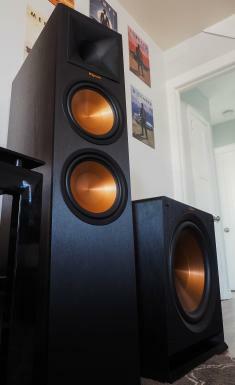 To quote Klipsch, "the R-115SW will not only wake your neighbors, it'll piss them off." These large subs were the hardest part of the system to accurately control. To be fair, my living room is smaller and not particularly flexible when it comes to placement, but there were times during 'Mad Max: Fury Road' and 'The Fifth Element' when I thought the pictures were going to launch off my walls. Luckily the smart folks at Yamaha and Denon have wonderful calibration software built into their AVRs to help tame the beasts. The one issue these subwoofers displayed was an imperfect Auto Power (or standby mode). On a few occasions, there was a delay between content playing and one of the subs powering up; and on several occasions, one or more did not completely turn off. Bottom line, I love watching movies with these thunder machines, but unless you have a larger listening space, you may want to consider only one of these bad boys, or dropping down to a smaller model in the series, especially if you own the RP-280F or RP-280FA towers. That said, I'm now auditioning dual 10" subs from another brand and there's a demonstrable difference (a drop) in overall room pressure. These subs are addictive. RP-260F Towers -- In most Klipsch demonstrations, these towers are used for back surrounds where they also serve as stands for the RP-140SA Dolby Atmos speakers, but I went a little off the reservation in my approach. In truth, they work great in that fashion too, but I ended up swapping them into the side surround position where they were much more engaging than any bookshelf monitor speaker (at perfect ear level to boot). You could also utilize these towers as a more budget-friendly front channel speakers, but after hearing the RP-280F and RP-280FA models, it's hard to go back. No complaints here. RP-250S Surrounds -- The only speakers I didn't love. This is likely more a me-thing than anything that speaks to quality, but I prefer my individual channels to be pin-point specific. And, after hearing the RP-280FA and RP-260F towers, I was much less enthused by how the RP250S spread sound in a wider fashion. It reduced, for me, spatial definition. However, after dropping these onto a shelf behind the main listening positing as back surround speakers, they did a very good job of filling in that back space, so I was pleased. If I were purchasing this system, I'd likely opt for a second par of RP-260F towers or R-15Mb bookshelf monitors. 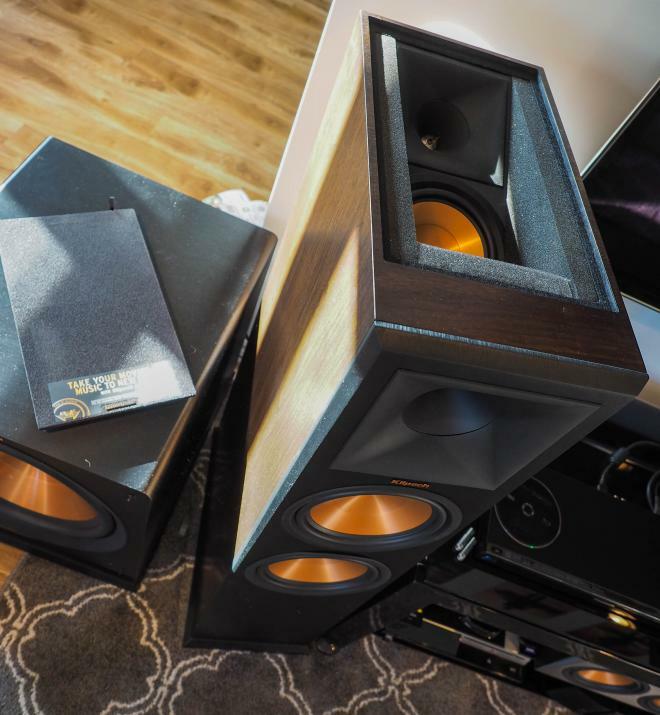 On the day 548 lbs of Klipsch speakers found their way into our living room, my wife walked in the front door later that night and stopped, staring at the grand Reference Premiere Series. The context here is that she is unbelievably supportive with my home theatre hobby addiction and has become even more enthusiastic over time. But there she stood, her mouth on the floor, eyes canvassing the huge system I had stuffed into our meager living room. "Okay," she said. "This time you've gone too far." To be fair, I kinda expected it. These speakers are massive. Fast forward three or so months to the day we pack them up and my wife, who was holding a box in place as a stuffed a 75 lbs subwoofer inside, says she's sad to see them go. She thinks they're gorgeous and sound amazing. In short, though we can't quite buy them right now, we're officially considering purchasing a set in the near future. 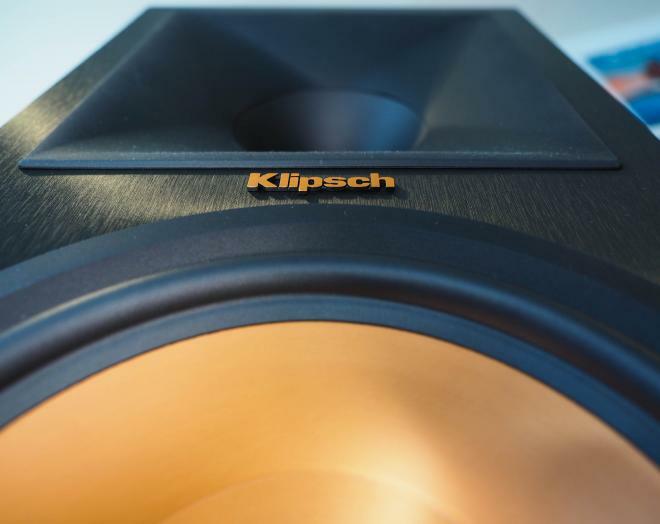 What more can be said about the Klipsch Reference Premiere Series? They play loud; they play heavy bass, they play screaming highs. They are delicate and nuanced. They are bombastic and brutish. They will turn your listening environment into a room that sounds almost as good as a commercial Dolby Atmos auditorium... And you won't have to drill holes to do it. Then again, the RP Series is not for every buyer. $5,600 - $7,400 is not cheap. They're so large they will own whatever space they inhabit. Dual 15" subs may be too much LFE at times. And there are moments where the elevation channels sound more like front channels than in-ceiling speakers. However, when it comes to the Reference Premiere Series, the pros far, far (far) outweigh any cons. If you're looking to get started with Dolby Atmos, and you don't want to drill extra holes or run extra wires, definitely give these speakers a demo via your local Klipsch authorized dealer (or just buy them right now on Amazon!). Simply awesome, they are the first piece of gear to earn a full 5-star rating from yours truly. 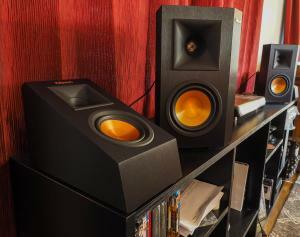 Interested in purchasing Klipsch Reference Premiere Series speakers? They are available directly via Klipsch.com (the list price at the top of the page reflects a 5.1.4 system), or via Amazon.com -- individual speaker links can be found in the above Specifications and Speaker By Speaker Breakdown sections of this review.